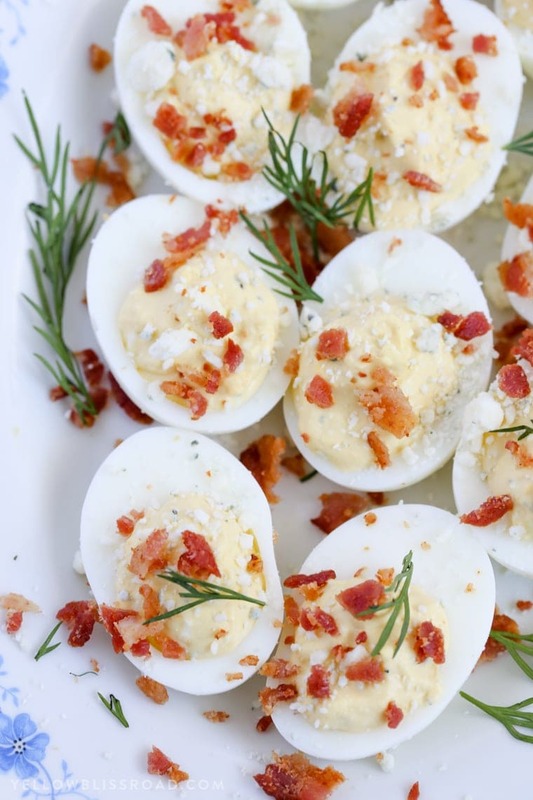 These Ranch, Blue Cheese & Bacon Deviled Eggs are the perfect enhancement to your Easter table. 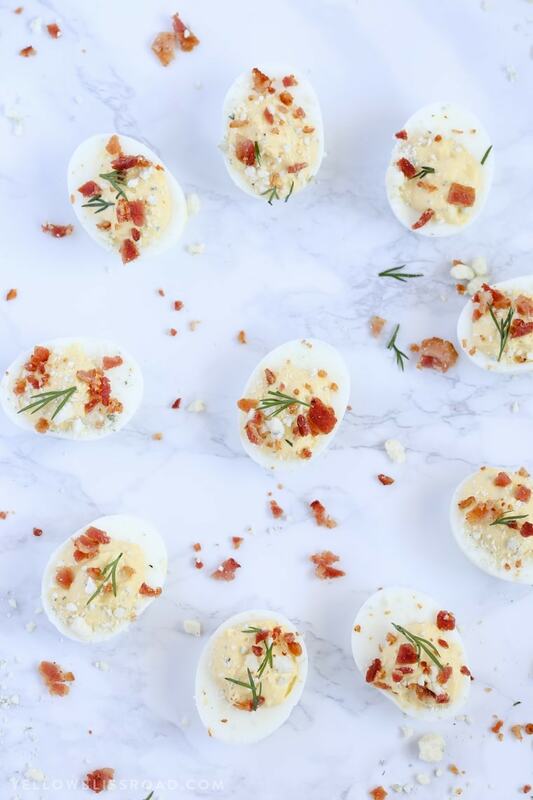 Super creamy, just salty enough and deliciously fresh, this is the only deviled eggs recipe you’re going to need this year! I recently realized that it’s been ages since I made deviled eggs. 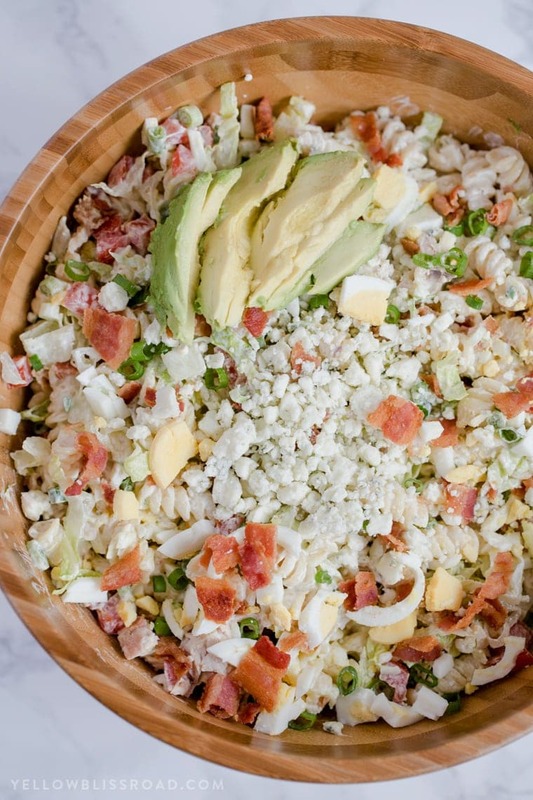 We have hard boiled eggs all the time, but rarely do we enjoy this special treat. 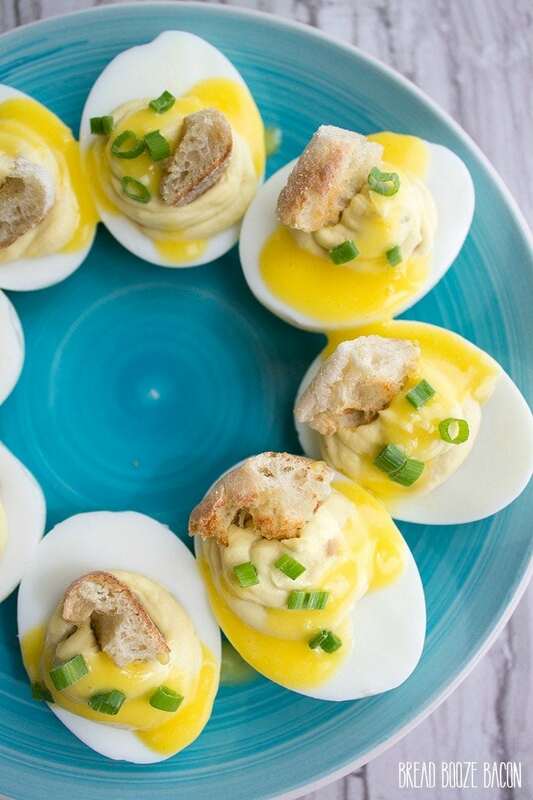 Growing up, my grandma was always the one who brought the deviled eggs to any function, both for family or for her various church groups and potlucks. There wasn’t any top secret ingredient or special method to her madness, they were just really, really tasty. Maybe is was the sprinkling of paprika on top or maybe it was just the care she took filling each individual egg with that creamy filling. Either way, they were delicious and gobbled up in minutes. 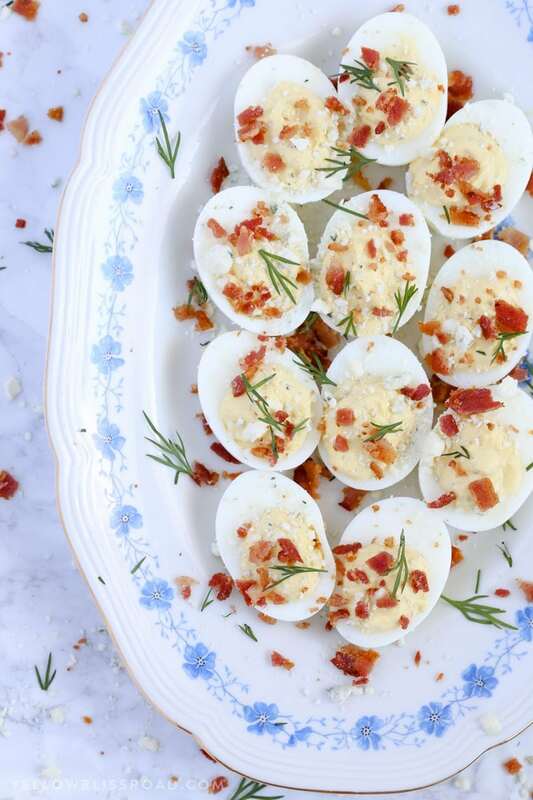 I have always enjoyed traditional deviled eggs but thought this would be a good chance to try changing them up and giving them a whole new flavor. 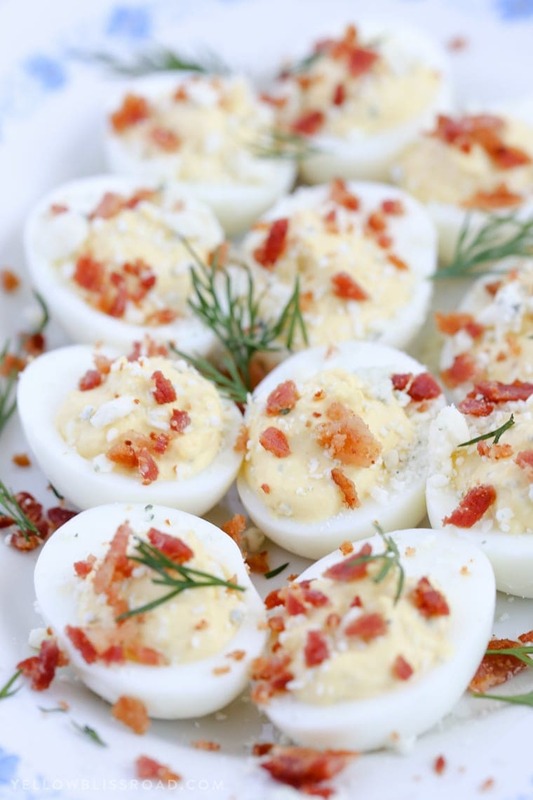 And thus the Ranch, Bacon and Blue Cheese Deviled Egg was born. 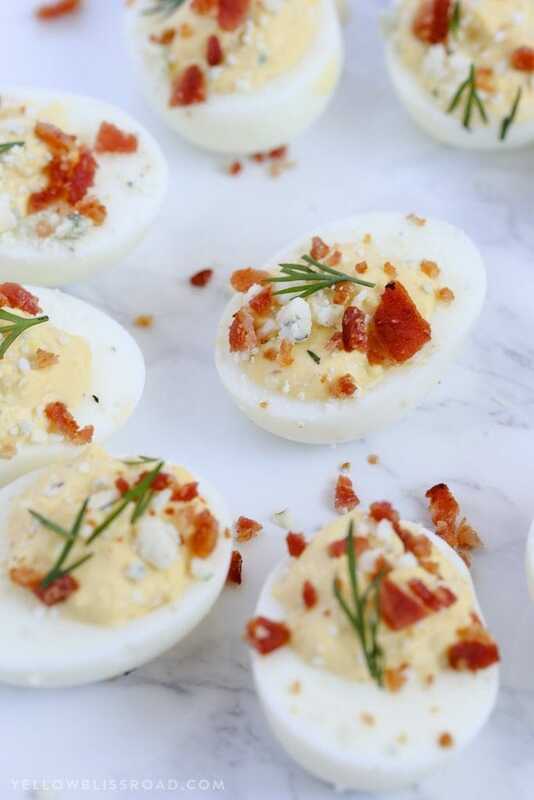 You know we like to keep things easy around here and these Ranch, Bacon and Blue Cheese Deviled Eggs are no exception. I usually like to boil my own using this fool-proof method, but I happened to have some already peeled and cooked eggs I had purchased recently at Costco in a big pack. What a time-saver! Because I’ve been on a blue cheese kick, and I’m always on a bacon kick I knew that was a flavor combo I wanted to pursue. I took it a step further and added ranch dressing, because, RANCH. 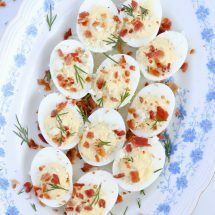 Then the typical ingredients you’d expect in deviled eggs – sour cream, mayo, dijon mustard and pepper. I added a pinch of salt too but you probably wouldn’t need to. Let me tell you folks, they were phenomenal. 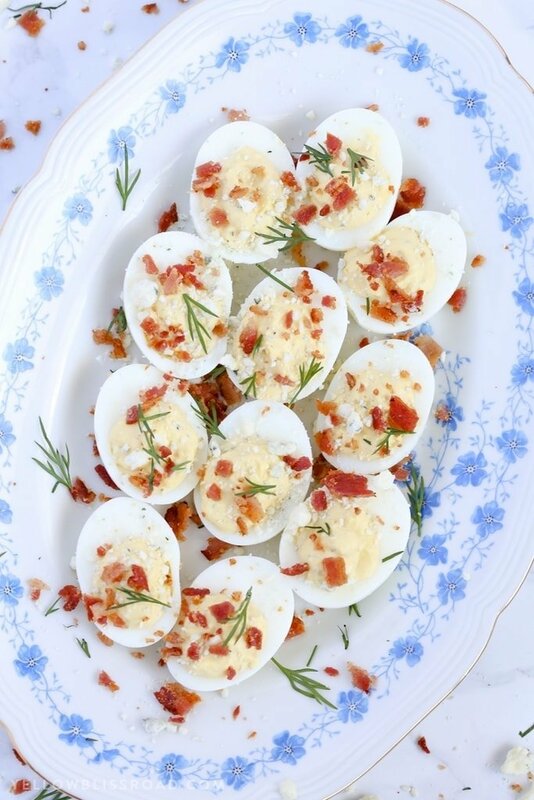 The tangy blue cheese pairs so well with the creamy yolks and the bacon adds a nice crunch. The fresh dill flavor from the ranch dressing just takes these little appetizers right over the edge. 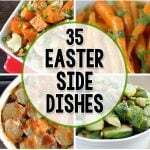 Perfect for Easter or any time game day eats, your family and your guests will be begging for more! Peel hard boiled eggs using your preferred method (or buy the already peeled kind at your grocery store). 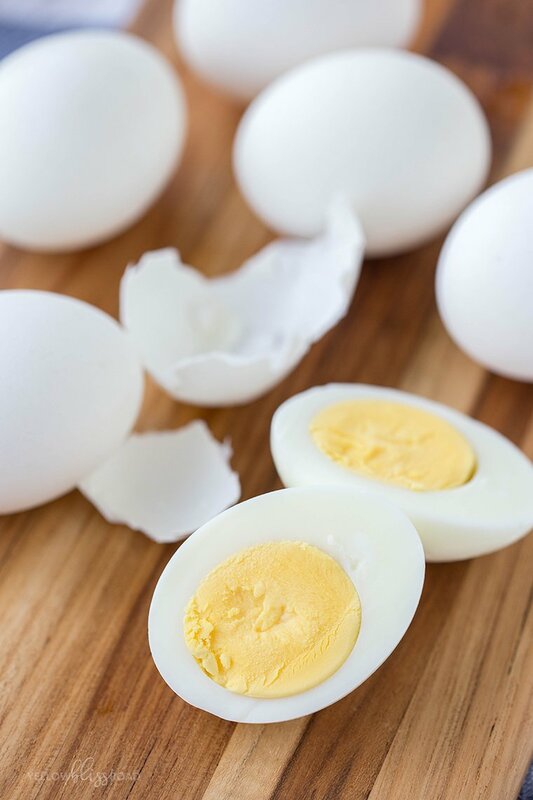 Slice each egg in half lengthwise and separate the yolks into a medium-sized bowl. 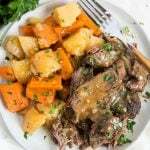 Add the blue cheese and mash the yolks and blue cheese together with a fork or potato masher. Stir in Ranch dressing, mayonnaise, sour cream, Dijon mustard. Add salt and pepper to your liking. 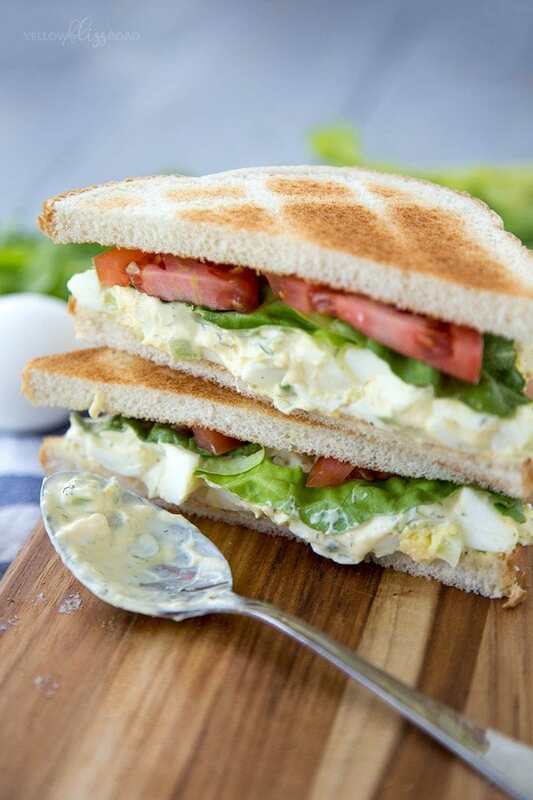 Grab a ziptop bag and fill it with the yolk mixture. Cut a small corner off, forming a makeshift piping bag. Arrange egg whites on a tray and pipe the yolk mixture into the holes. Top with blue cheese and bacon crumbles. Garnish with fresh dill, if desired.